The old parade ground between the rear of the Castello Sforzesco and the Arch of Peace has been turned into a park in the centre of Milan. Naturally the park, called Parco Sempione in Italian, has a lake. 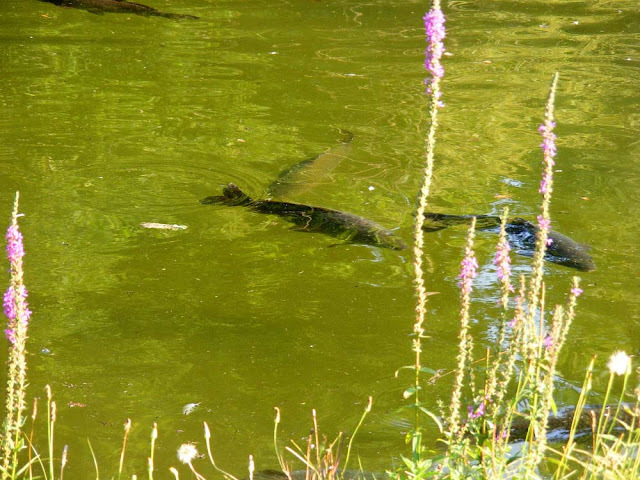 In and around the lake live various entertaining critters. 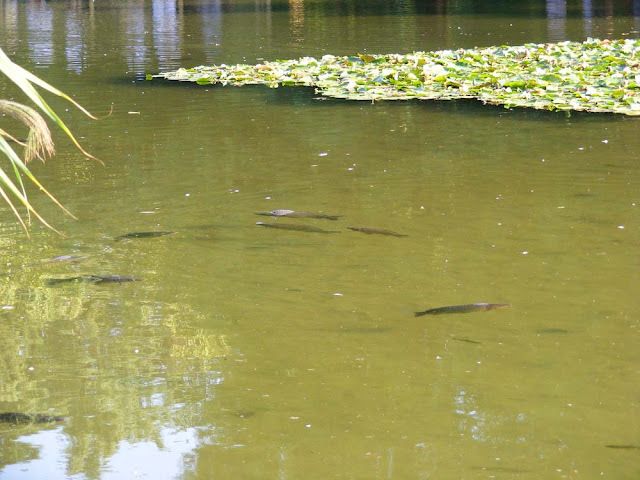 Carp, joined by darter dragonflies posing on tall bankside vegetation. With Purple Loosestrife growing on the edge of the water. Big ones and little ones. Looking back towards the Castello Sforzesco. 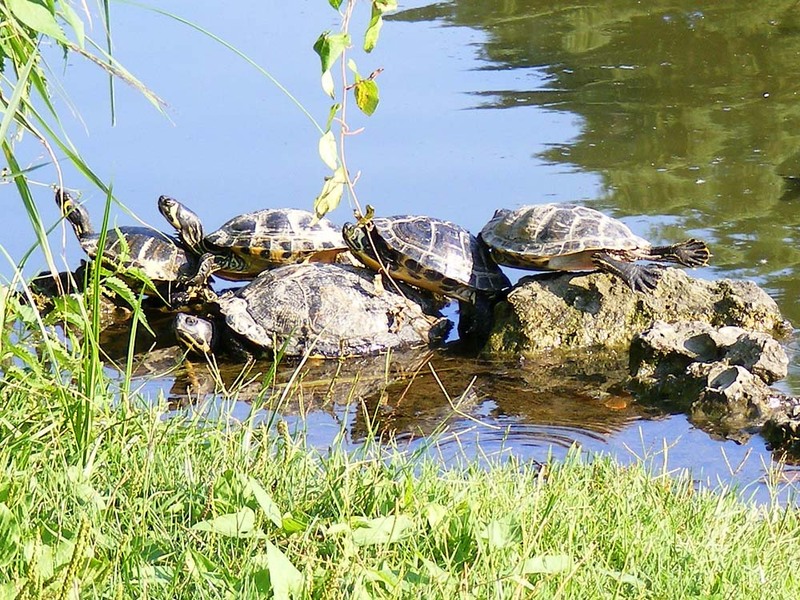 Terrapins hanging out in the sun. Butterflies and Neonics: First it was bees, then birds, now it's butterflies. A newly released study report indicates that it is quite likely that neonicotinoid pesticides are linked to a decline in certain species of butterflies in the UK. There is a suspicious looking correlation between the dates neonics became widely used in the UK in the mid-1990s and a dive in populations of generalist countryside inhabiting species of butterflies (ie those that breed and forage in farmland, ). The trend is particularly strong for grassland butterflies, which have long been studied Europe wide and taken to be indicator species. Equally, there is no such correlation between the introduction of neonics and butterflies with more specialist habitat requirements (this is no cause for celebration though, as these 26 species are already known to have dramatically declined in the 1970-80s). The population of 17 common and widespread farmland species declined by 58% between 2000 and 2009, despite a substantial increase in spending on agri-conservation projects and despite no clear evidence of habitat deterioration in that period. Seasonal variations and their affects on breeding success were taken into consideration when calculating the fall in population. The scientists likened the effect they were seeing as similar to having a continuous run of very bad summers. The problem seems to lie with the persistance of neonics in the environment, in plant material, soil and water. At this stage the results indicate a correlation but do not show causation. It is possible that neonics are a proxy for other environmental factors associated with intensive agriculture. More studies are no doubt in the pipeline, and it seems fairly likely to me that these results will prove relevant to rural France too. Tropical savanna is a grassland habitat that is combined with open woodland. To technically qualify as such the trees have to be spaced far enough apart that they do not form a continuous canopy. Tropical savanna is warm and light, allowing a dense covering of grass under the trees. Understorey plants do not suffer from being shaded out as they would in tropical rainforest. The other characteristic that is required for tropical savanna is highly seasonal rainfall, with the majority of the annual rainfall arriving in a single season. Tropical savanna also frequently forms an intermediary habitat between desert and true forest. 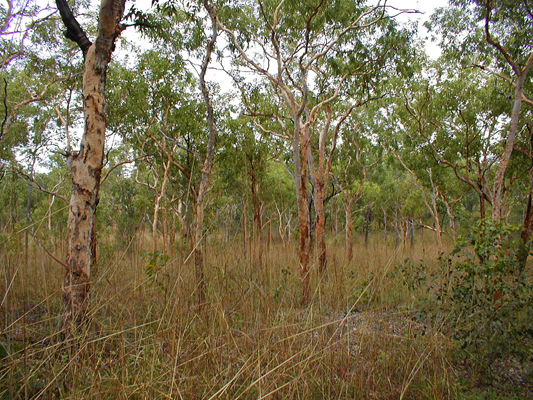 Typically, native people around the world manage tropical savanna by fire, and that is true of the area shown here, in the Northern Territory of Australia. As much as any other influence on these environments, man has had a hand in shaping them. In the case of the Australian tropical savanna, it has been a managed environment for tens of thousands of years. Traditional burning created a mosaic of micro-habitats which increased biodiversity. The burning prevents the understorey scrubbing over and eventually turning into forest, and provides fresh grazing for prey animals such as macropods (kangaroos and wallabies). Australia's tropical savanna is the least known of the major geographical regions where this type of habitat occurs. Much more famous are Brazil's Cerrado and Africa's Serengeti. A la cuisine hier: Since I made Chocolate Chestnut Souffle Cake a few days ago I had 16 egg yolks sitting in the fridge. In my usual spirit of anti food wastage I used them up by making custard, vanilla icecream and mayonnaise. All was going well until I got to the mayonnaise. In the process of whisking the oil into the egg yolks with my new hand held plunge whisk and goblet it all got out of control and I sprayed mayo over myself and the surrounding kitchen. That's the second time I've done it using this new ensemble, so it is not getting a third chance. The goblet is too lightweight and is impossible to stabilise (unless you have three hands). I narrowly avoided getting mayo in the custard, which would have made me even madder. For dinner we had palets savoyards, which I had never heard of before but picked up on special at the supermarket. They are a pork patty with a slice of reblochon cheese on top and wrapped in bacon. There were no instructions for how to cook them so I baked them in the mini oven on quite a hot temperature, with a little stock in the dish. That way the bacon and cheese on the top browned and the bacon underneath and the patty braised. Served with mashed potatoes, steamed broccoli and wavy cut carrots. The chapel at the Hospice Saint Roch in Issoudun has a pair of astonishing carved limestone 'family' trees set in the corners of the east wall and dating from around 1500. The one on the left is a Tree of Jesse, showing the line of kings leading to Jesus Christ, but the one on the right shows how he is descended spiritually from a line of prophets. The kings featured are traditionally taken from the Gospel of Matthew. Above David is his son Solomon, then Rehoboam, Abijah, Asa, Jehoshaphat, Jehoram, Uzziah, Jotham, Jehoahaz, Hezekiah, Manasseh, Amon, Josiah, Jeconiah. However, the absence of distinctive signs and the disappearance of the names painted on their banners means we can't now name the Issoudun kings with certainty. The terrestrial line, the issue of the tribe of the kings of Judah, supported by a fig tree, is complemented by the spiritual and religious line of Jesus. The great priests, patriarchs and prophets who announced his coming are arranged according to a symmetrical composition seated in the branches of an oak tree. Moses carries the tablets of the law. At his side, clothed in a fleece (perhaps Gideon) then in the centre Aaron at prayer, as befits the first high priest and older brother of Moses. Also there is Melchizedek the priest-king who blesses Abraham, lying there in place of Jesse. All denoting the signs of recognition of the messiah who is placed, bound, under the pelican, the symbol of sacrifice. The bulk of the tree crushes the monsters that are there to indicate to the pensionners and patients at the hospice that faith will triumph and good will be victorious over evil. 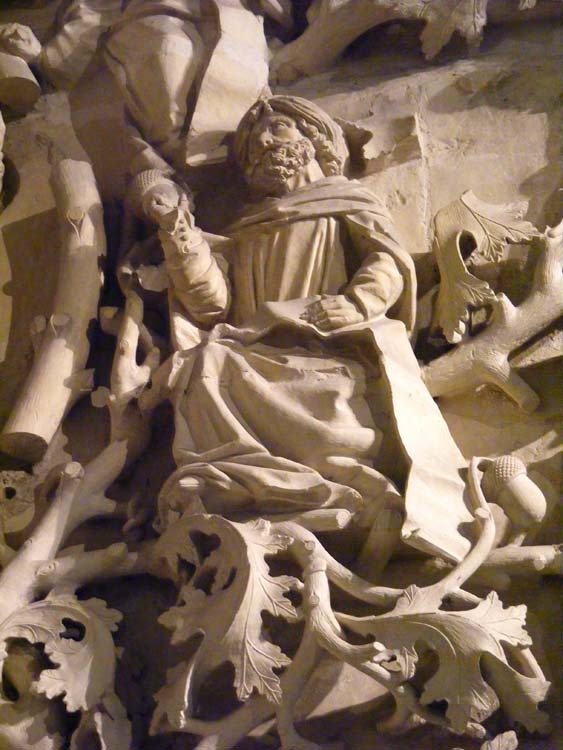 The virtuosity of the modelling of the prophets, and of the depth of undercutting of the leaves is attributed to the workshop of Gilbert Bertrand, who made other statuary in the chapel. 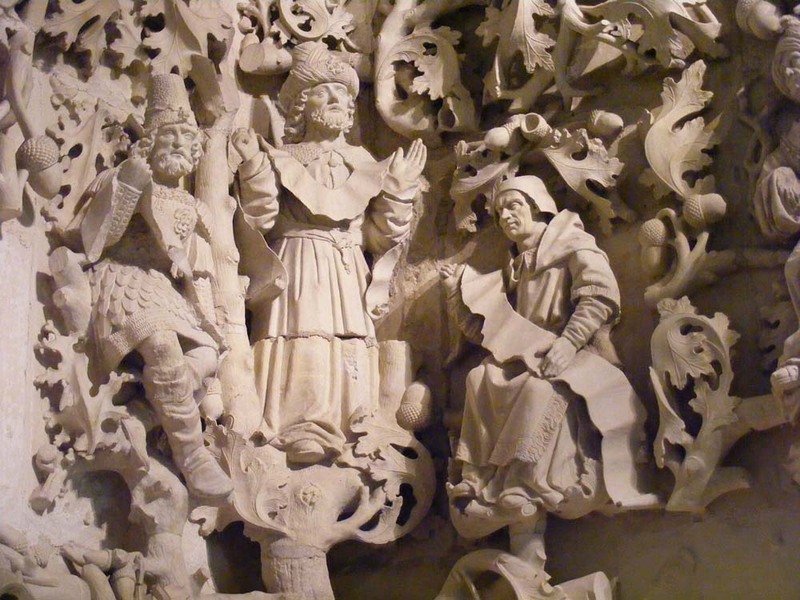 The decoration is a proliferation of foliage and plants, integrating human figures and animals. Originally it was painted, and the cornice frieze allows us to get a glimpse of the original effect. 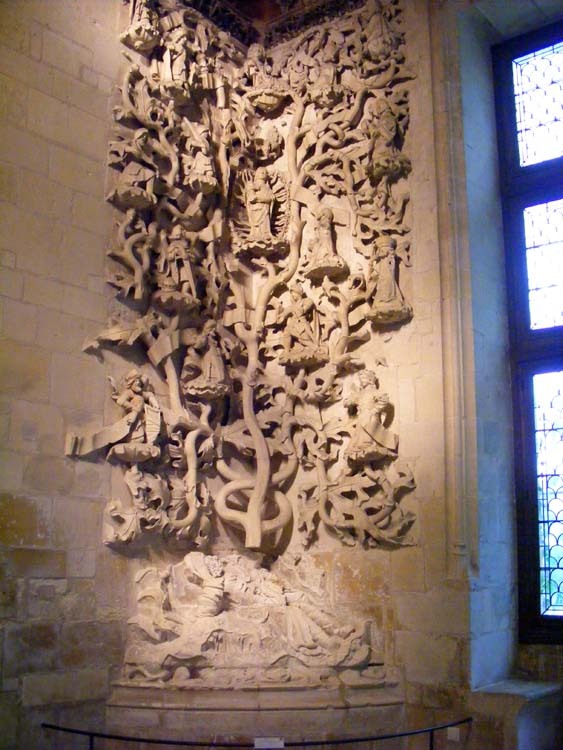 This chapel is remarkable because of the two 'family' trees, which are unique in France. These masterpieces are classed as a historic monument in their own right. The stone decoration is both spiritual and realistic. The limestone is local, a stone which is soft at first, but hardens on exposure to the air. The blocks of stone were roughed out off site, then put in place and the fine detail added. The dull natural colour of the stone was enhanced with paint to really emphasis these beautiful details. paint work, as well as marks left by the tools used to carve the figure. The striking effect of the sculptures comes about in part from the setting, but equally from the play of light and shade of the carved shapes and the contrast of flat surfaces against contours. The carving is very fine at the base and more acomplished in the oak tree than in the fig. The higher figures are less finely carved. Moses is the first of the prophets and the most prestigious, placed at the bottom far left. He would live to be 120, lead the Israelites out of Egypt and teach the law. He is presented here as an old man, glowing with an inner light and with a dignity that is not observed in the other characters. Simply clothed, head and feet bare, he has two horns on his head which are the symbols of divine power. He carrys the tablets of the law and his name is inscribed on the hem of his robe. The priest or prophet on the bottom far right is very refined in his clothing. He wears a necklace and an under tunic with pleated sleeves and fastened with a button. His cloak is trimmed with a jewel encrusted fringe. This priest wears a turban, signaling the 'orientalism' of these figures. The turban symbolises dignity and power. The higher the status the bigger the turban. 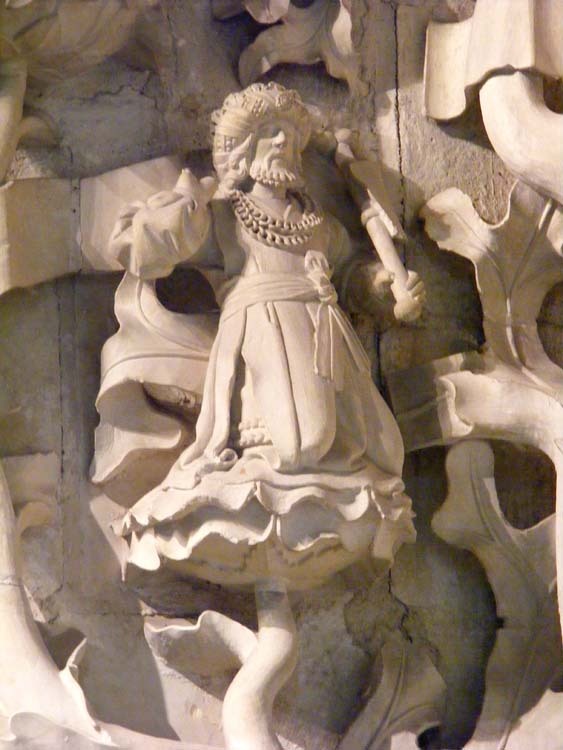 The figures of the prophets depicted in the oak show a great variety of costumes, accessories and hairstyles. The prophets wear robes and wide cloaks, with the exception of one, who is clothed in a short tunic and boots. In the 14th century it was headgear that distinguished the status of individuals. From hoods to domed conical caps, felt hats to multiple forms of bonnets, whether long haired or cropped, all the heads are covered with the exception of Moses. More than the gestures or the lost names, it is the costumes that provide the symbols of the priesthood. 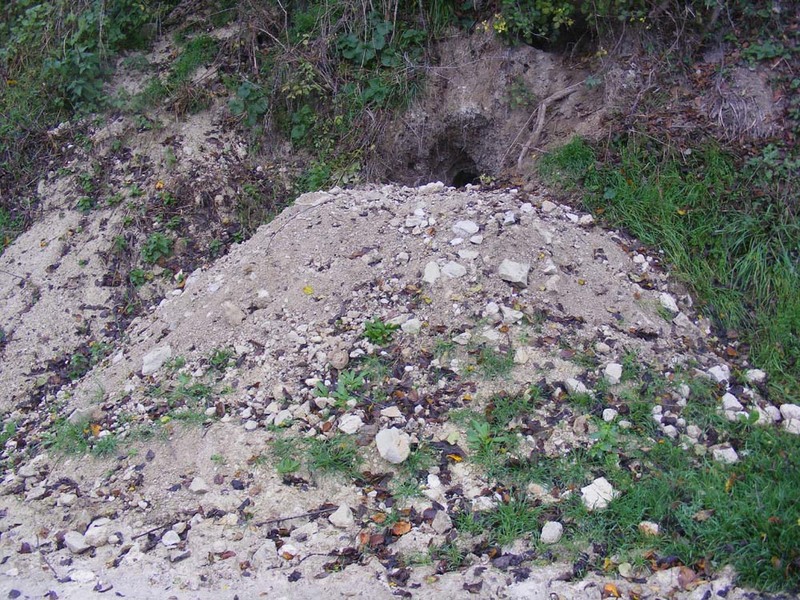 I suspect that the badgers who occupy this multistorey sett near Chaumussay are asking for trouble which may lead to them being evicted in a thoroughly unpleasant and sadly permanent way. This is what the sett looked like in April 2015. Renovations, extensions and general home maintenance have clearly continued apace since then. The farmer will be worried about his field boundary collapsing on to the road, and so will the roads department and the local council. While I was taking these photos a couple of days ago a truck full of hi-viz clad road workers bombed past on their way to lunch (it was 11.45). 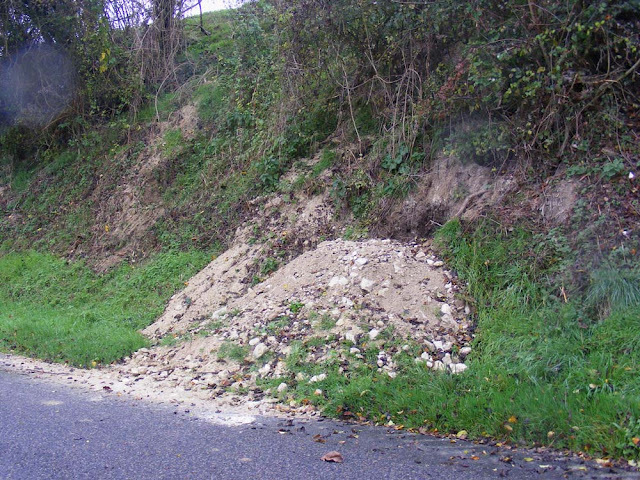 I have no doubt they are now fully expecting a complaint about the condition of the road complete with photos from me. Swift Evening: The indefatigible Amboise based campaigner for Swift conservation Carolyn Knowlman has organised an evening at Amboise Chateau on Monday 30 November. The aim is to highlight the issues this fabulous bird species is contending with and offer advice on how we can help. Swallows and Martins will also be covered. She is thrilled to have enticed Edward Mayer, President of Swift Conservation as guest speaker. He is one of her heroes in the field. There will also be a speaker from Switzerland and one from the Ligue pour la Protection des Oiseaux (LPO). The evening starts at 6.30 pm and will be held in the Salle des lys. Entry is free. Tours Station Panels: SNCF have emailed to say that after lengthy negotiations and studies of the ceramic panels in the station at Tours, restoration is set to commence in April 2016 and the first panel will be put back in place sometime during the year. They thank everyone who got involved by donating to the restoration fund. Those people will be publically acknowledged with a plaque listing all the names under the first panel to be returned. Le Jean Bart is a bar in le Grand Pressigny. 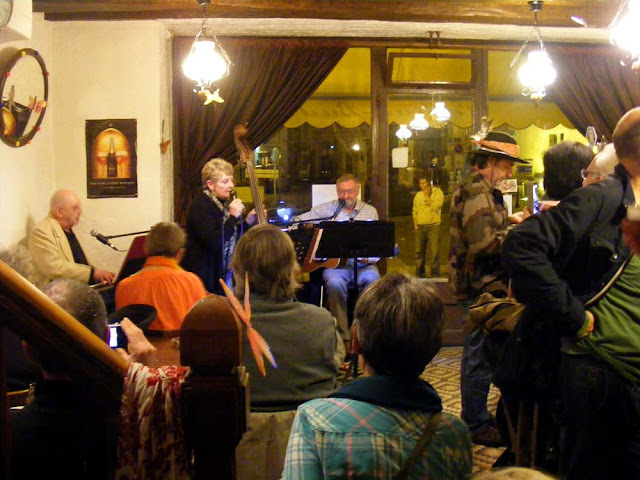 A week ago we attended a Beaujolais nouveau event there. Normally we wouldn't bother with such a thing but our friend Pauline had alerted us to the fact that she would be singing, so we went along to show support. The wine turned out to be very drinkable. Frankly we were amazed, because Beaujolais nouveau is usually frightful rotgut and nothing more than an advertising wheeze. The long hot summer has obviously had an effect on even the youngest wine. The atmosphere at le Jean Bart was intimate, relaxed and friendly. There was about an even split between French and Anglos. 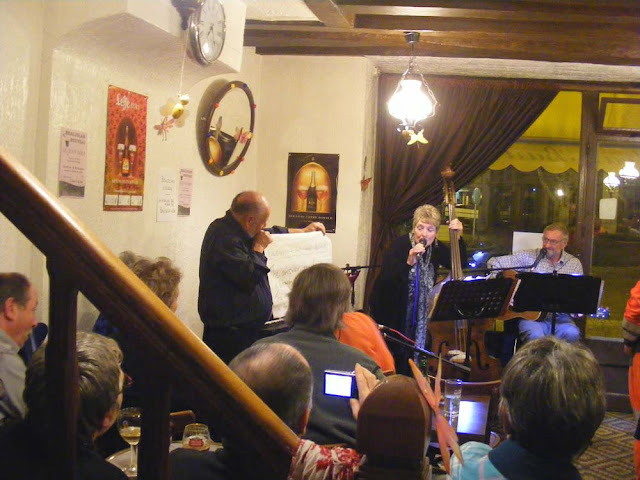 Most people knew one another (not difficult in a small room in a small village).The audience was encouraged to sing along and a member of the audience roped in to hold up a lyrics sheet. Some of the songs were in English (Blowin' in the Wind) some in French (Les Champs Elysées). The musicians were a mixture too. Even the dog joined in. Just recently I was told that there was a magnificent carved dragon on a front door in rue Faubourg Saint Nicolas. I'd never noticed it, so quizzed my informant about it. He said it was perfectly visible from the street and was the work of local wood carver, Robert Loyau. Like many of his 20th century contemporaries, Robert had worked at Dennery, the furniture factory that closed in the 1970s. Preuilly is full of retired wood carvers and cabinet makers. The factory employed several hundred people in its prime. It once supplied furniture to the super rich all over the world (Saudi Arabians found it particularly to their taste apparently). Eventually the factory closed because tastes changed but the style of furniture Preuilly produced didn't. The Preuilly factory furniture was solid, dark, weighty and heavily carved. 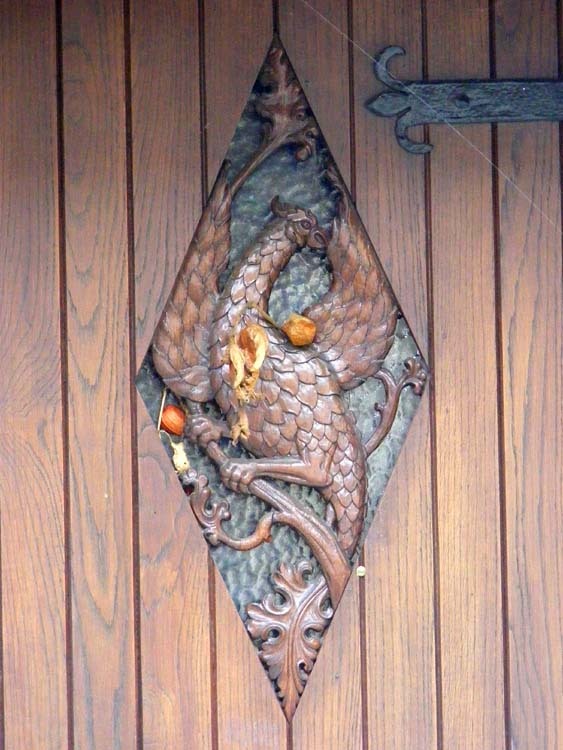 Anyway, the door in question turns out to not feature a dragon but a fenghuang, also known as a hoho bird or a Chinese phoenix. I imagine it is a design from a pattern book. There is a long tradition of chinoiserie in Europe, and the fenghuang features widely in many an 18th century wallpaper and printed cotton cloth. It was a motif used by the Chinese in artwork destined for both the domestic and export markets, as well as being adopted by European designers producing homegrown chinoiserie. For more information about this cross cultural exchange see my friend and ex-colleague Emile's blog, Treasure Hunt. Emile is a bit of an expert on this sort of thing (he would modestly deny this, but he is, and beginning to get the recognition he deserves for it). 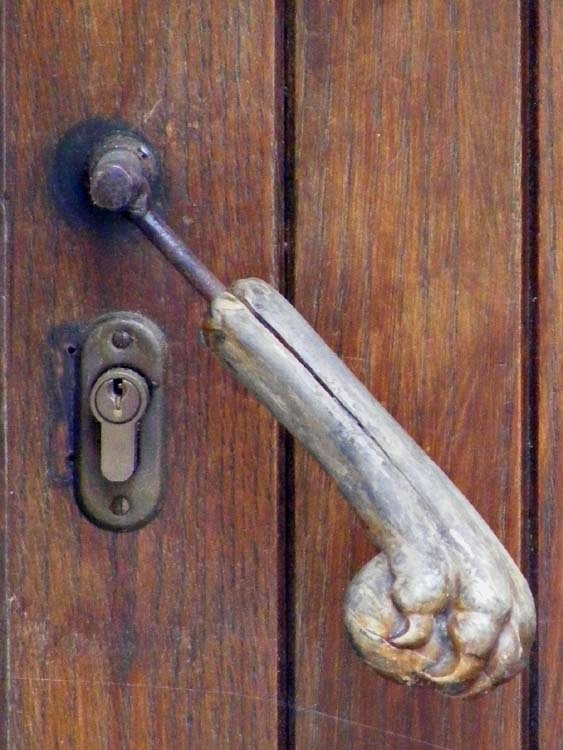 but I wondered if it was antler, not wood. The house is unremarkable apart from the door. And it's for sale. A la cuisine hier: Chocolate Chestnut Soufflés in our new ring tin, which turned out to be a) not big enough to take all the soufflé mixture and b) the hole in the centre proved to be bigger in diameter than a wine bottle, so I was unable to cool it upside down. I also got four individual soufflés out of it. 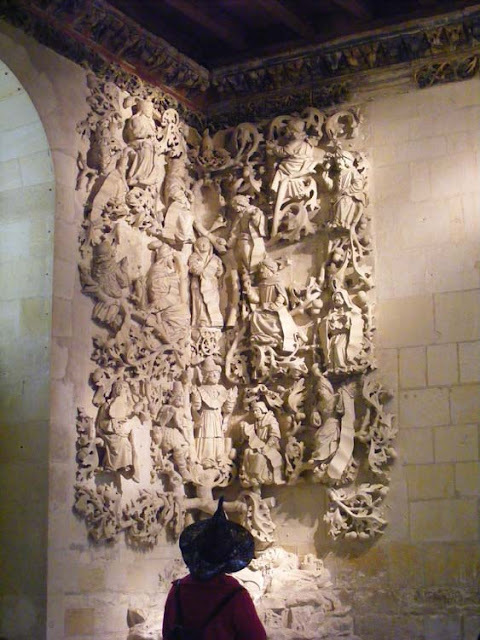 This impressively writhing mass of carved limestone is one of a pair in the corners of the chapel of the Hospice de Saint Roch in Issoudun. 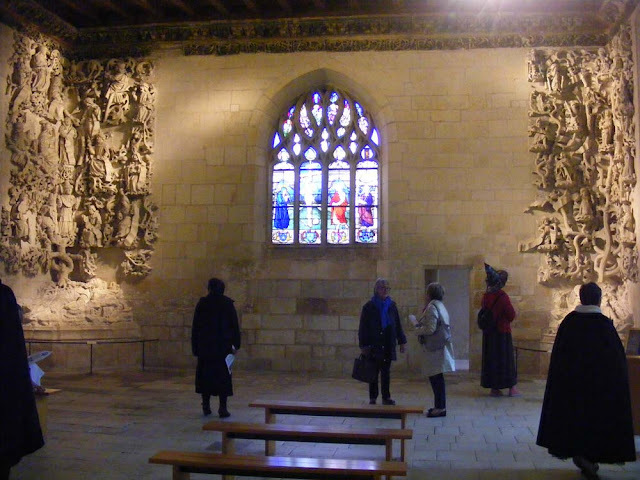 At the end of the 15th century Pierre de la Chèze, rector of the hospice between 1494 and 1510, ordered the construction of a new chapel, probably in 1502. It was to be bigger and more luxurious than its predecessor, a modest oratoire. He enriched it with a significant collection of sculpture, much of which still survives in situ. No other space or building in the hospice is this lavish. Quite the contrary. Everywhere else in the complex the architectural watchwords are functionality and simplicity. The north wall is entirely rendered in fleurs de lys, originally painted in golden yellow on an azure blue background. A polychrome vegetal frieze follows the contours of the junction between wall and ceiling of the chapel, regularly punctuated by six supports for beams ornamented with the twelve apostles. On either side of the stained glass window depicting the Crucifixion there are two monumental scupltures, more than 5 metres high, in very high relief decorating the corners of the eastern wall, in place of a retable. They illustrate a theme, the Tree of Jesse, very widely found in Europe, but in a manner more lush and extravagant than anywhere else can boast. This pair of Jesse Trees is unique in Europe and was listed as a National Monument in its own right in 1908. The sculpture is beautifully executed, by an unknown workshop. The east wall of the chapel. This representation of the Tree of Jesse is inspired by several biblical texts which announce the coming of Christ as a descendant of the family of Jesse. According to the Prophet Isaiah "And there shall come forth a rod out of the stem of Jesse, and a Branch shall grow out of his roots, the spirit of the Lord resides within him..."
Jesse, his name encrusted in black letters in the limestone, is stretched out, eyes closed, dreaming of his descendants. From his torso emerges a fig tree, with branches supporting fifteen kneeling ancestors from the royal line of Israel. Starting with his son David, recognisable by his harp, to Joseph and the baby Jesus in the arms of Mary, triumphant, against a radiating backdrop and crowned by two angels. The design is held together with the representations of vegetation throughout. It is the tree itself which directs the eye, and a cohesiveness with the rest of the room is achieved by the foliate cornice all around the room. All the plants chosen are of course symbolic. 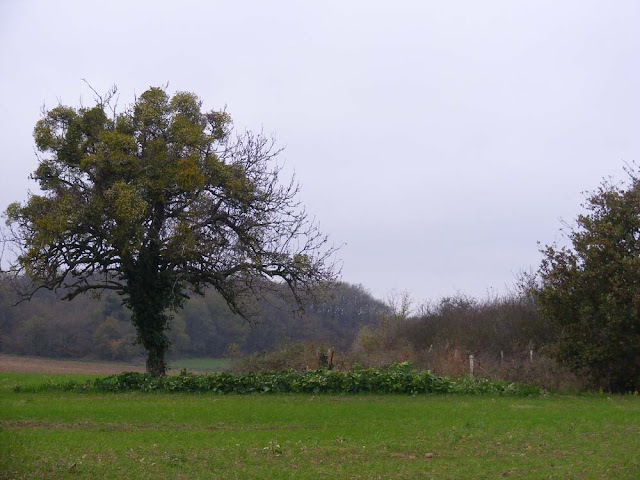 The oak tree has particular significance in the Bible. It is both magical and earthly, allowing messages from the heavens to be transmitted to the Earth. As a timber for secular purposes it was seen as having no equal, and it was near an oak tree that Abraham received his revelation. 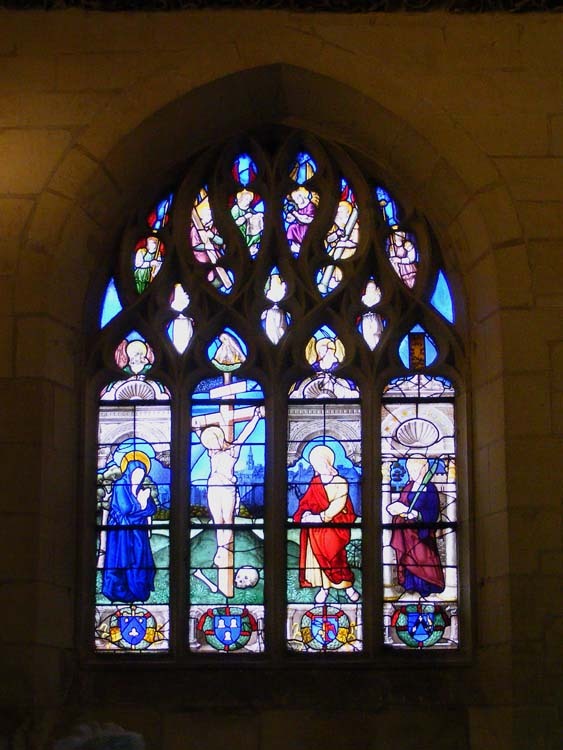 The east window, depicting the crucifixion. The fig tree, native to the Mediterranean, was possibly thought of as the Tree of Knowledge of Good and Evil. It is held in high esteem and figures in biblical studies of the time. In the Book of Kings the trees ask that the fig rule over them. The flowers on which the kings kneel resemble lotuses, a quite usual decoration for seats or footrests of the time. It signifies that the person installed on them has an elevated spiritual authority over and above the ordinary person. The treatment of the characters is in typical Medieval realistic style. This ensures the viewer of the time is in no doubt as to the fact that these people are powerful kings, in their European costume and arms. They are all in fact very similar in terms of their armour. They wear an assortment of plate or mail armour on all the exposed parts of their bodies and limbs -- elbow guards, mail hosen, knee guards and breastplates. Some of the kings carry weapons -- swords and arbalests. The arbalest, or heavy crossbow, is a piece of portable artillery dating from the 12th century, and an extremely formidable offensive weapon. It had a long range and could be fired accurately. Its use was at one stage forbidden. Those that are not armed carry sceptres. The emblems are repeated and all the kings are kneeling except the third, Rehoboam the Proud. David was the second king of Israel, the son of Jesse, born in the year 1000BC. 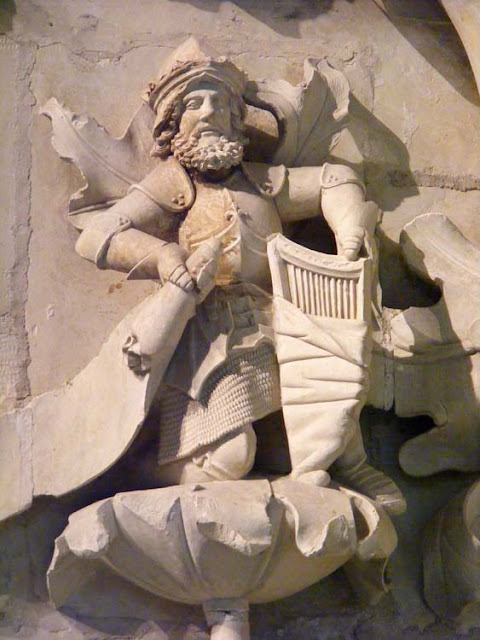 He is depicted as a warrior, with his armour, telling the viewer that he made Israel a great state, through the strength of his cunning and courage. Equally, he is a poet and a musician, the composer of the psalms. The lyre allows us to identify him with certainty. Jesse is the character who appears as a visionary, a prophet, the nearest to the living. 'A shoot will come up from the stump of Jesse; from his roots a Branch will bear fruit' (Isaiah 11:1). Jesse was an old man when David was born. 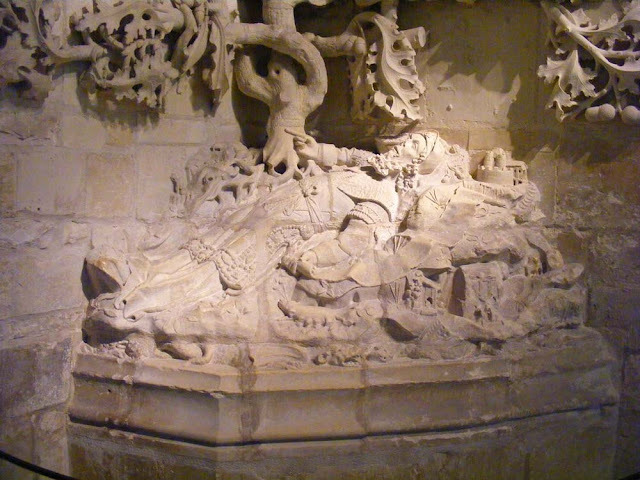 This late birth, after Jesse had given up hope of a son, is assimilated by the medieval scholars in the iconography of the Virgin Mary giving birth to the Christ child. Other Biblical texts reinforce the link between the tree and religion, like the vision of Seth, or Jacob's ladder, unifying heaven and earth. The tree is the symbol of the universal church. This style of genealogical tree over the centuries was adopted by science and became the tree of evolution in the 19th century. A la cuisine hier: Four jars of quince jelly (Fr. gélée des coings). Of all the fruit jellies I think quince is my favourite. Plus it gives you quince pulp for making dulce de membrillo later. No waste here. The 19th century Arco della Pace today marks one of the ancient gateways into Milan. 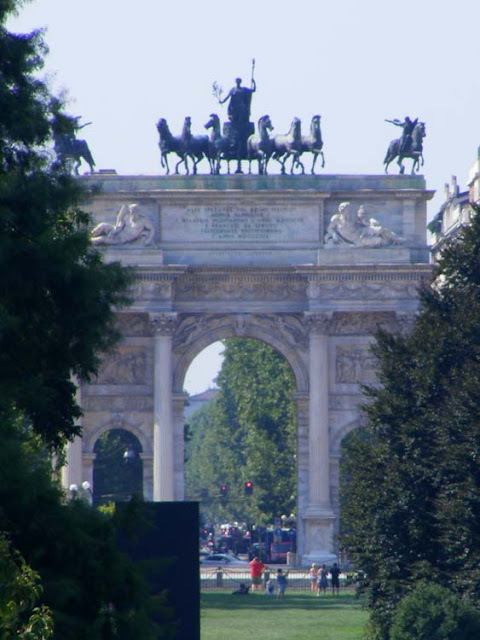 The current arch was started by Napoleon in 1807 and the road it adorns connects Milan to Paris across the Alps. The arch was not finished until 1838, and was ultimately dedicated to the 1815 peace congress held in Vienna to sort out Europe after the defeat of Napoleon. 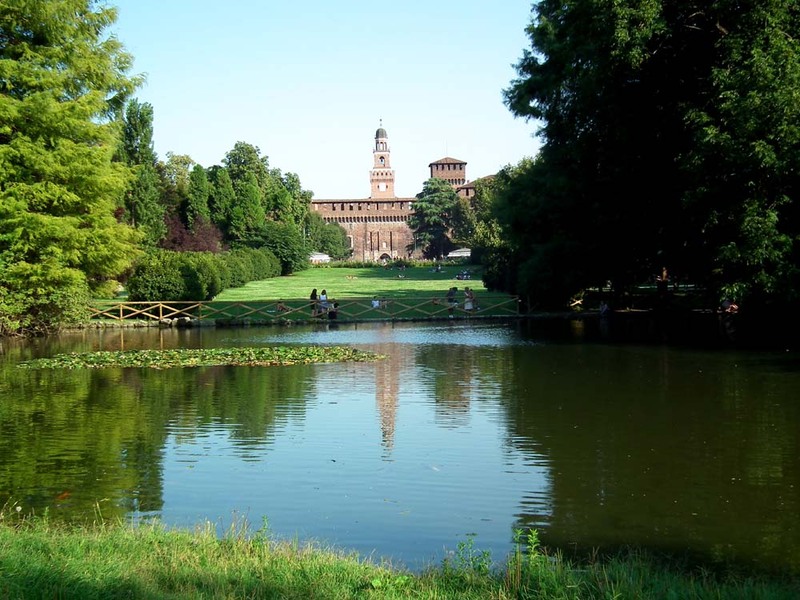 It is linked to the Castello Sforzesco by the Simplon Park, which is landscaped to create panoramic views of both landmarks. The arch is neo-classical, decorated in low relief scuplture in a variety of materials (marble, wood, bronze, stucco). The statuary refers to historical and mythological events as well as allegories representing the four major rivers of the area. Many artists worked on the edifice. The 25 metre high triumphal arch is topped by bronzes depicting Minerva (Goddess of War) in a six horse Chariot of Peace and four outriders known as the Victories on Horseback. Or something -- the various interpretations I found of the iconography don't make much sense to me. Perhaps they reflect the rather confused origins of this victory turned peace monument. Originally the bronze equestrian group faced Paris, but they were turned around to face the city of Milan. 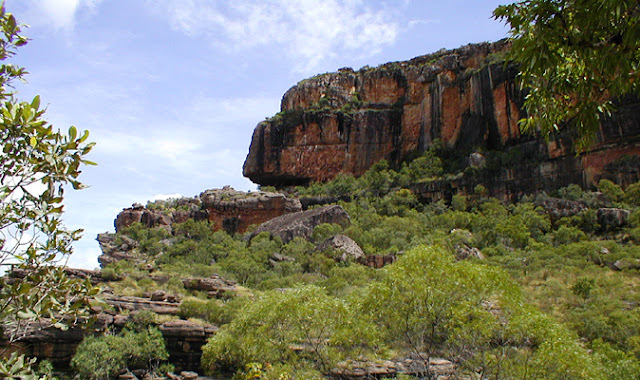 This rock formation is Rainbow Serpent's sign, warning you to be respectful as she is close. Almudj, the Rainbow Serpent, is probably the best known of the Australian Aboriginal Dreamtime figures. With her passing through the landscape she creates waterholes, ravines and ranges of hills. Now she lives at the bottom of a deep pool fed by a waterfall and guarded by a rock formation. Sometimes she rises from the pool and floods the land. Wrongdoers will be drowned. Other times she stands upright on her tail and you can see her as a rainbow in the sky. Although it is permitted to see her image painted on the rocks at Ubirr, she herself should not be sought out or disturbed. Namarrgon, the Lightning Man, is a powerful Dreamtime creation ancestor. He uses his stone axes to split the heavy grey clouds and make thunder whilst lightning bursts from his ears and toes. The spectacular lightning show is the beginning of the Wet (as the monsoon season is known). He lives in a rock shelter on the Arnhem Land escarpment. Non-aboriginal people are not allowed into Arnhem Land except by invitation. Looking towards Lightning Man's home. Cookery Workshops: The Association Familles Rurales in Betz le Chateau have run a regular Thursday once a month cookery workshop (Les Ateliers Gourmands) in the Salle Verrier (Clubs Meeting Room) for some time now. I've never been but they look fun and the themes are always interesting or useful. On Thursday 19 November from 6.30 pm to 9.30 pm the workshop will be on fresh pasta with a tomato and anchovie sauce, as well as a cream and mushroom sauce. The workshops are run by professional cook and caterer Christelle Royauté. To book or for more information contact Brigitte Joubert on 06 74 02 77 72 or brijoubert @ wanadoo.fr (take out the spaces when emailing). The December workshop will be on foie gras. 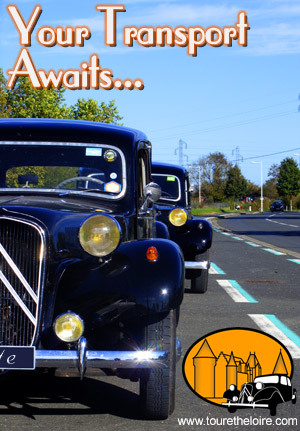 It strikes me that these workshops would be an excellent way to practice your French in a friendly and natural atmosphere. You don't have to be a member of the Association to attend. The workshops just cost a couple of euros more if you are a non-member (€15 for members, €18 for non-members). Membership of the association costs €25. Apologies for the late notice of the pasta workshop. This post was originally scheduled for last Sunday and I moved it in order to post my response to the Paris terrorist attack. I obviously didn't check this post for content before rescheduling it. Anyway, the general information and suggestion still stands. 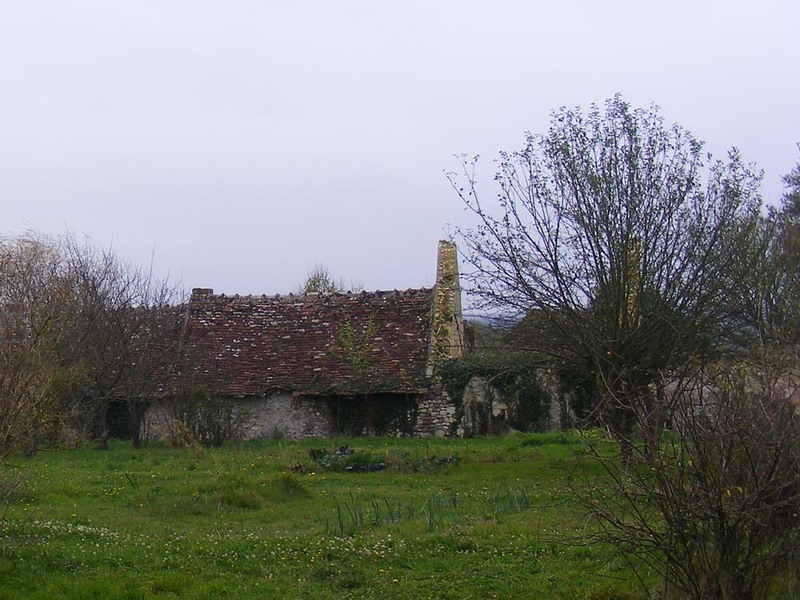 Parts of this old farm complex have seen better days, but the 15th century farmhouse itself has been lovingly restored by its current owners. The farmers must have been making their own wine from a little parcel of vines within living memory, but it has been abandoned now. The adjacent fruit tree is covered in mistletoe too. The buildings show that this was no peasant farm, but minor aristocracy. Built into the walls of the house are 42 niches for pigeons. To be raising squab (baby pigeon) for the table meant that the king had given you permission to set aside some of your staple crop of cereals to feed a luxury crop, pigeons. You had to be able to demonstrate that you had enough land to produce sufficient cereal that you and your farm workers would not go hungry if the pigeons ate some of your cereal. 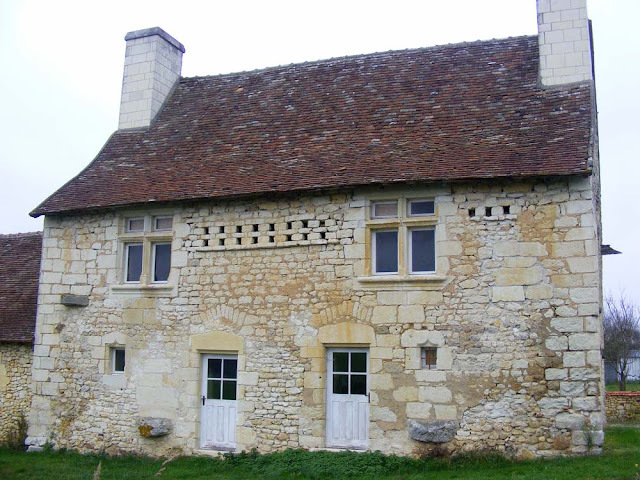 The main farmhouse, with its charming architectural details of ogee shaped lintels, mullions and boulins (pigeon niches). The other side of the main range. Outbuildings in various states of repair. 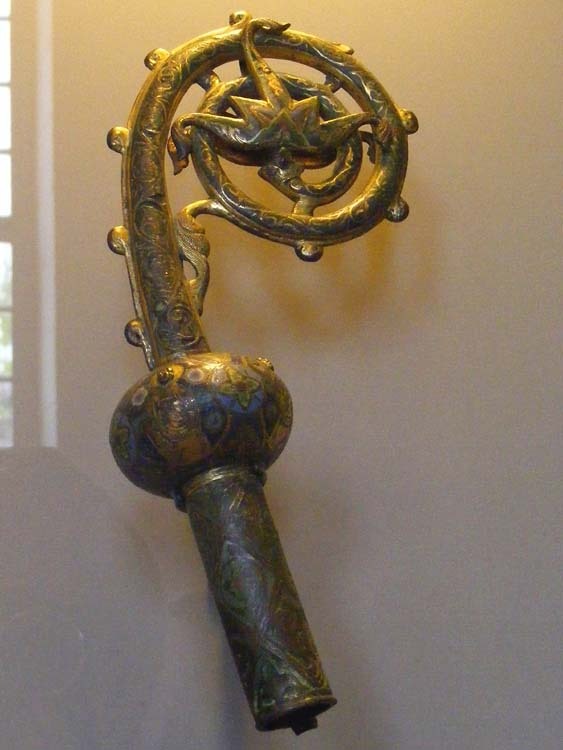 This gilded copper and champlevé enamelled crozier dates from around 1200. It was found in the tomb of an abbot at the Abbey of Notre-Dame, Issoudun in 1853. It is now displayed in the former hospital ward of the Hospice Saint Roch, now a museum. The cover of the tomb it came from can also be viewed in this room. According to a study of 13th century Limousin croziers the Issoudun crozier belongs to a group of thirty-four examples distributed all over Europe. They are distinguished by the same central motif of large stylised flowers in the volute. The closest in appearance are those from Angers, Carcassonne and Carpentras. Dated to the end of the 12th century they precede croziers with animal motifs and historic scenes. The decoration is done using the champlevé technique. Coloured enamel is put in small depressions which are etched out of the copper. The cylindrical socket, decorated with fantastical birds in lozenges, would have taken a shaft of wood. Above, the node shows the busts of the evangelists, their heads slightly raised from the background level, in four oval medallions. Around this part a piece of cloth would have been attached, to protect the copper from the acidity on the palm of the hand. The shape of the crozier, with a wooden shaft terminated by a flowery volute is inspired by the legend of Aaron's rod, recounted in the Book of Numbers, where the priests are identified by the miracle of the rod bursting into flower. 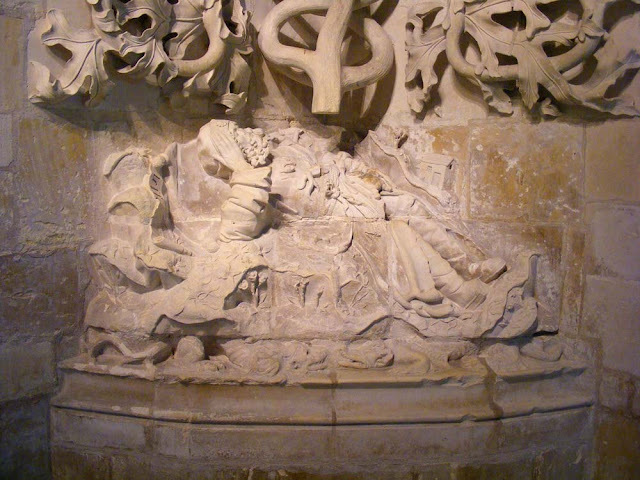 Aaron's rod has another legend attached to it, whereby it became a serpent, which would account for the undulating shaft shown on the tomb, and the reptile head of the volute. 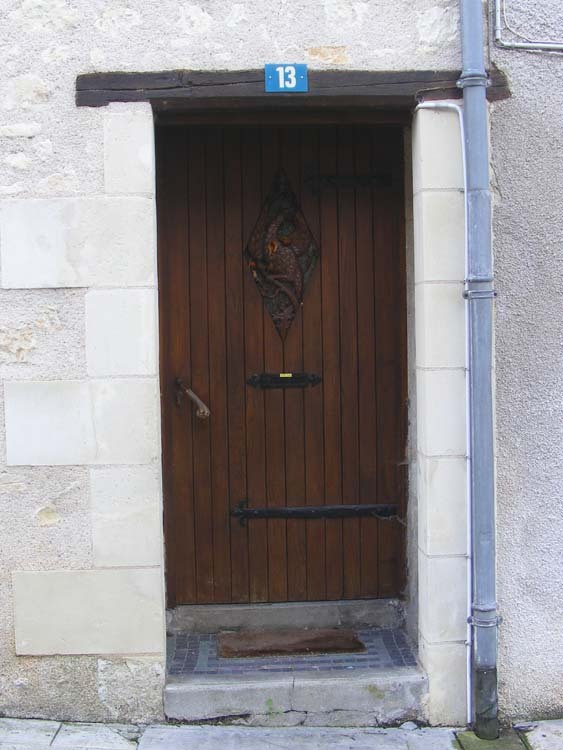 Light a Candle: Residents of Indre et Loire are invited to put a candle in their window at 9.20 pm tonight. Exactly one week after the Paris attack, it is a symbolic gesture in hommage to the victims. See here for further details. This recipe has been doing the rounds of the internet all year. It first came to my attention when Simon sent me a link to a Facebook entry by someone in Normandy who had made them. Since I am still using up our pantry full of homegrown apples I decided to make them myself and take to Tim and Gaynor's annual curry evening. Grease a 12 berth cupcake tray (unless you are using silicone). Put the water and lemon juice in a bowl that you can use in the microwave (or a medium sized saucepan). Cut the apples in half vertically (ie from stem to blossom end). Take out the apple cores (a melon baller is useful, or just cut out with a paring knife). Slice the apples horizontally. This gives the most even curved skin edge to your apple slices. Slice as thin and evenly as you can. Use a mandolin if you have one. As you slice each apple half put the slices immediately in the acidulated water so they don't brown. Microwave the apples in the water for 5 minutes (or blanch on the stove). This makes the slices more flexible but doesn't cook them enough that they disintegrate. Microwave the apple jelly for 30 seconds (or heat in a small saucepan) to make it easier to spread evenly. Sprinkle some flour on the bench, lay out one of your your puff pastry sheets and roll it to stretch it out so it is thinner than pre-rolled pastry and forms a rectangle about 22 cm x 30 cm. Divide the pastry into 6 strips about 5 cm x 22 cm. Smear each strip with a couple of teaspoons of apple jelly. Lay the apple slices along one long edge of the pastry strip so that the curve of the apple slice projects very slightly beyond the pastry and each slice overlaps the other by about half. Fold the other long edge of the pastry up to partially encase the row of apple. 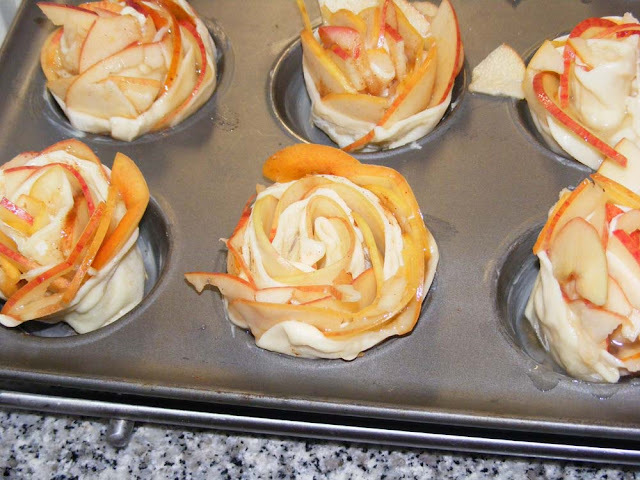 Press gently to embed the apple a bit and prevent it moving so much when you start to roll them into roses. Take one end and start rolling. 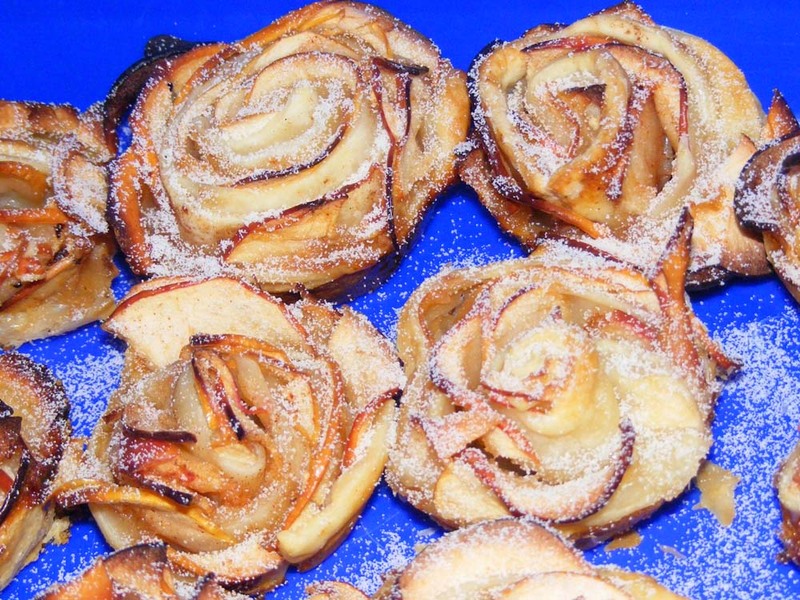 The apple slices will more or less automatically form themselves into a petal like arrangement. Roll all the way to the end of the strip. Place the rose in a cupcake well. Repeat steps 10 - 17 until you have a dozen roses. Bake for about an hour. After half an hour turn the tray around and loosely cover with a sheet of foil. After 45 minutes check every 10 - 15 minutes for doneness. If in doubt give them 10 - 15 minutes more as there is a lot of moisture in them and the pastry needs to be crispy not stodgy. Remove from the tin immediately and cool on a rack. You may need to run a knife around them to release them from any escaped toffeeised apple jelly. Serve slightly warm, with vanilla icecream or custard. puff pastry comes in different configurations in different countries. The best for this recipe is pre-rolled rectangular sheets. These are rare in France, but I have seen them in Auchan. I have done the recipe with the usual circular pre-rolled French puff pastry. Just roll the circle in one direction only to get an elongated oval and line up your apple on the straight edge of the outer strips. These two outer strips will make slightly smaller roses, but it's not really a problem. Blocks of puff pastry could also be used, just roll them out thinner than normal and try to keep their rectangular shape. use perfect medium sized apples. If you have to cut bits out it makes them more difficult to arrange on the pastry and they have a tendency to poke up at funny angles. Don't use an apple with a bitter skin, such as Red Delicious. Discard the round end slices and cut your slices paper thin. A mandolin is useful if you have one. The apple slices need to be flexible but remain intact. don't use so much apple jelly it oozes everywhere. This is a bit difficult, because you have to use enough to give a reasonable level of sweetness. 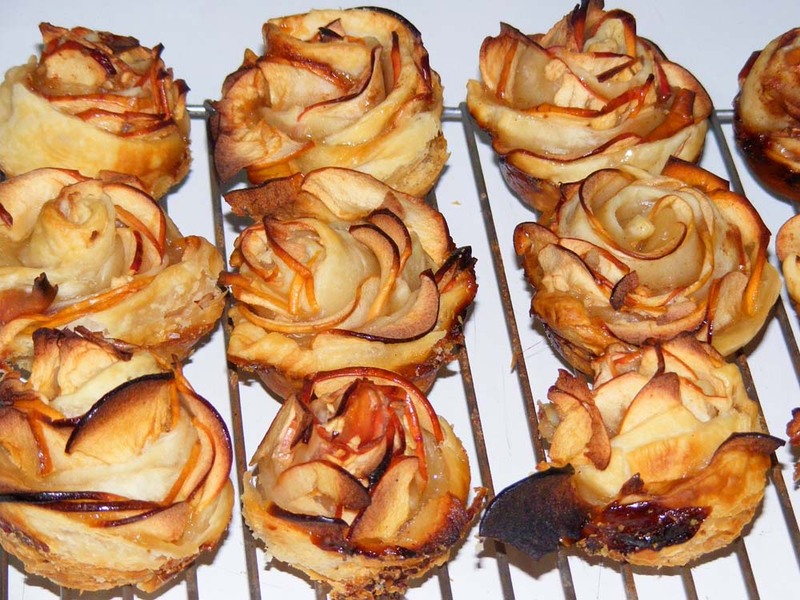 when you roll the pastry around the apples to form the roses the apples will want to slide up and out of their pastry sandwich. Just keep gently tapping them back as you roll. use a silicone cupcake tray if you can. If you don't have one use a regular cupcake tray that has been really thoroughly greased. Don't be tempted to put the apple roses in cupcake papers. Apparently the roses won't come out. don't worry if your roses don't look perfect on going into the oven. You'll be amazed at how they come out, and any remaining irregularities can simply be dusted with icing sugar. Hey presto! All is beautiful and appetising! Dusted with icing sugar and packed up to go to the party. For those of you who can't be bothered with such long written instructions, Cooking with Manuela has a video demonstrating the method. It's not quite as easy as she makes it look, but it's fairly easy. 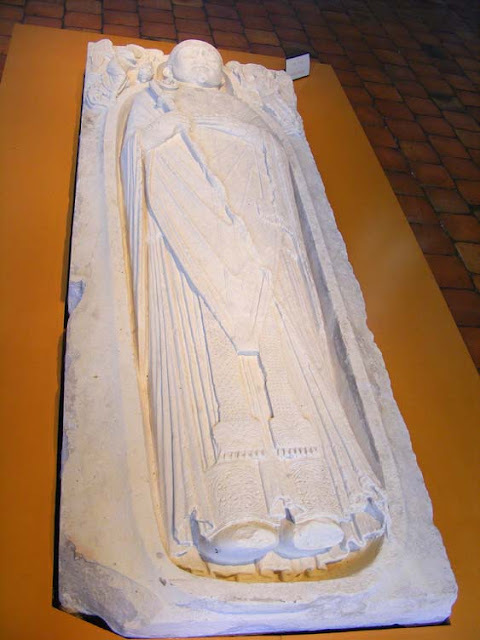 This late 12th century effigy is carved from limestone and came from a tomb in the crypt of the Abbey of Notre-Dame in Issoudun. It was discovered in 1853 when the building was demolished to make way for the courthouse (palais de justice). It is now housed in the former hospital ward of the Hospice Saint Roch, which is now a wonderful museum. The very high quality carved slab rested on an arcaded support under an arch of a chapel. According to records of the find the tomb contained a skeleton dressed in silk and linen, which disintegrated when the tomb was opened. The cover of the tomb has a representation of the deceased, shod in sandals, bare headed, tonsured. He holds and wears the insignia for his office. His chasuble is studded with jewels, he has a stole around his neck, a maniple on his left arm and holds a crozier in his right hand. This last is formed by an undulating shaft finishing in a smooth node topped by a volute with the head of a reptile. It is an external realisation of the enamelled crozier discovered within the tomb. The abbot is depicted at the moment of his resurrection, with an angel on each side of the coffin swinging their censors to accompany the ascension of the soul of the deceased towards heaven. His left hand is placed on his chest in a sign of acceptance. According to a recent scholarly examination this masterpiece of the end of the 12th century could be attributed to a workshop in Sens, which worked on effigies at Nesle-la-Reposte and then at Chartres. 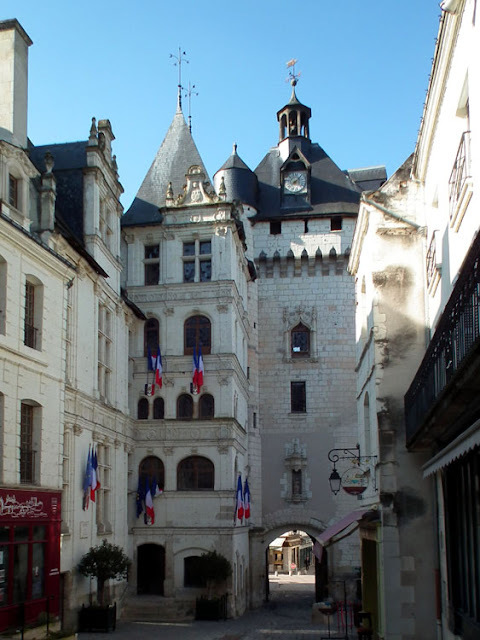 The Hôtel de Ville (Town Hall) in Loches dates from 1543 and is built of limestone. 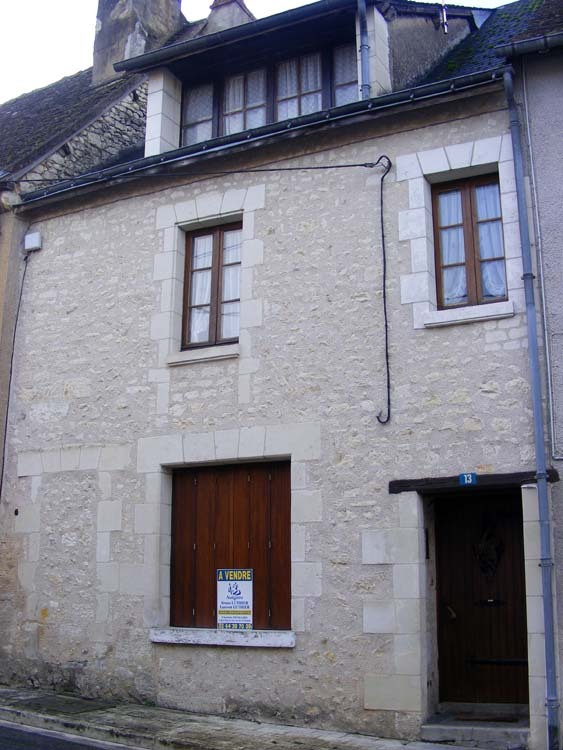 In 1519 the King François I gave the authorisation by letters patent to the town councillors of Loches to construct their town hall. The work was delayed due to financial issues and because five proprietors, having lodgings on the site, had to be removed. Directed by the master mason Jean Baudoin the work dragged out between 1535 and 1543. The Hôtel de Ville is the L-shaped building on the left, with the French flags flying. The master mason was confronted by two principal technical problems. First, the plot envisaged, whilst long, did not allow the town hall to be constructed with the gable on the street, the King having forbidden the demolition of the Porte Picois (Picois Gate) next door. 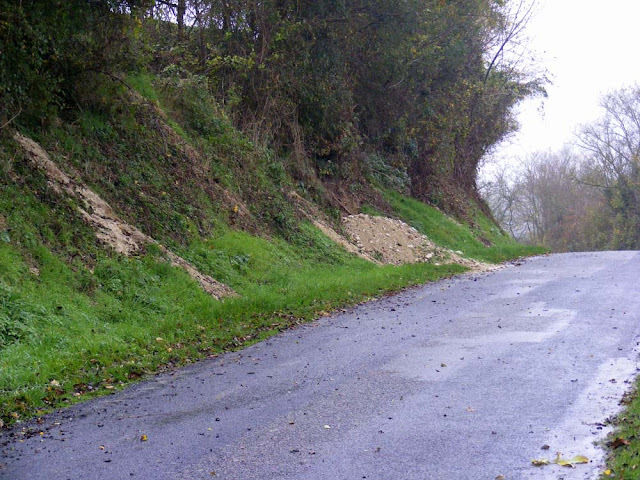 Jean Baudoin therefore constructed two ranges parallel to the street. Second, the interior space wasn't big enough to construct a straight ramp staircase. 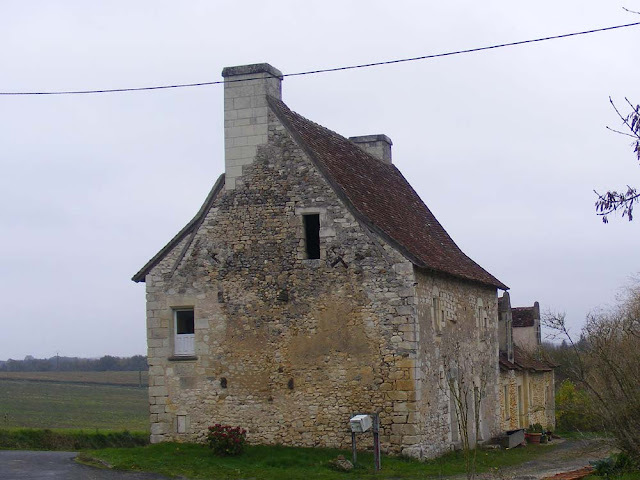 The master mason in the end built a square tower backing on to the Porte Picois, to serve as the stairwell. The decoration is sober, comprising two levels of double transverse mullioned windows bordered by voluted capitals, the heads of lions and putti. The spandrels of the first floor are delimited by a frieze of circles and lozenges. 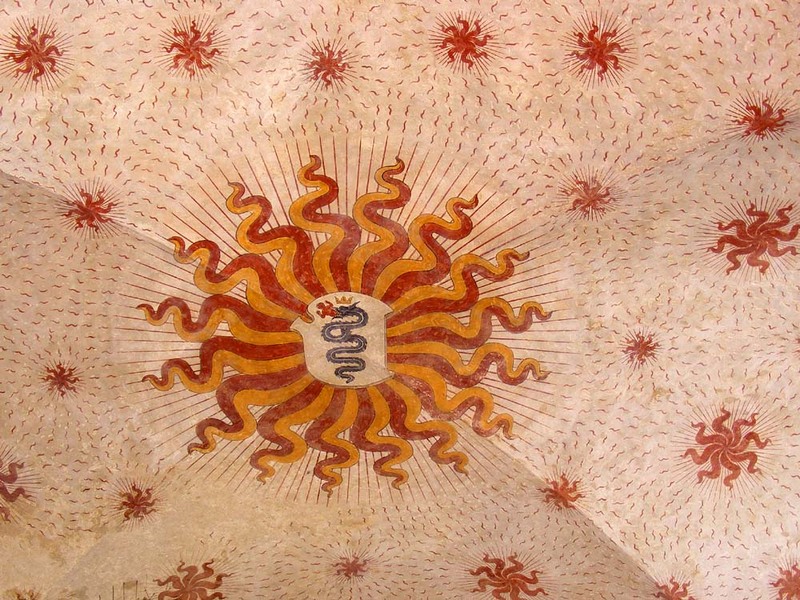 At the summit a dormer window is ornamented with the salamander, the symbol of François I. The building has retained its function as the town hall since the date of construction, which is exceptional. Loire Valley Nature: A new entry has been added for the Deathcap mushroom Amanita phalloides. This common mushroom is the most deadly of them all. A new entry has been added for Devil's Fingers Clathrus archeri. You may smell this distinctive stinkhorn fungus before you see it. A photo, probably of Peltigera polydactyla, has been added to the Dog Lichens Peltigera spp entry. The fruiting bodies are bright orange. A section for Fairy Inkcaps Coprinellus disseminatus has been added to the Inkcaps Psathyrellaceae entry. These are lovely little toadstools. A new entry has been added for Caesar's Mushroom Amanita caesarea, uncommon here but one of the most prized of edible mushrooms. A section for Lentinus tigrinus has been added to the Bracket Fungi Polyporaceae entry. 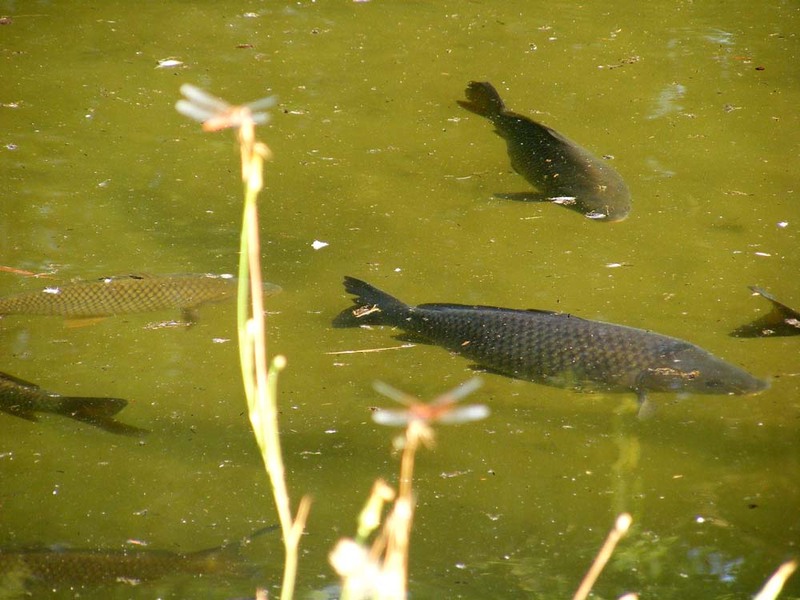 This species has gills, so is an unusual member of the family. 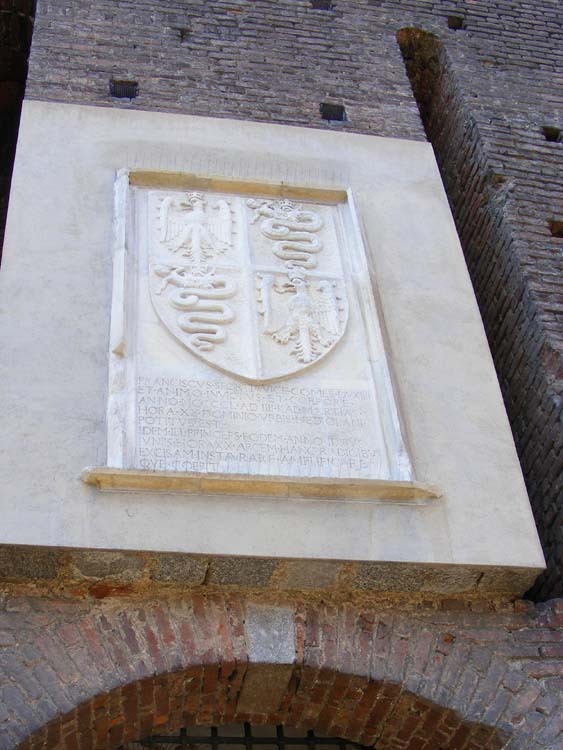 The Visconti family of Milan used a great serpent or basilisk known as a biscione (grass snake) as their family emblem. It is depicted with a person in its mouth, either a Saracen which it is swallowing, or a child, which it may be swallowing or giving life to. 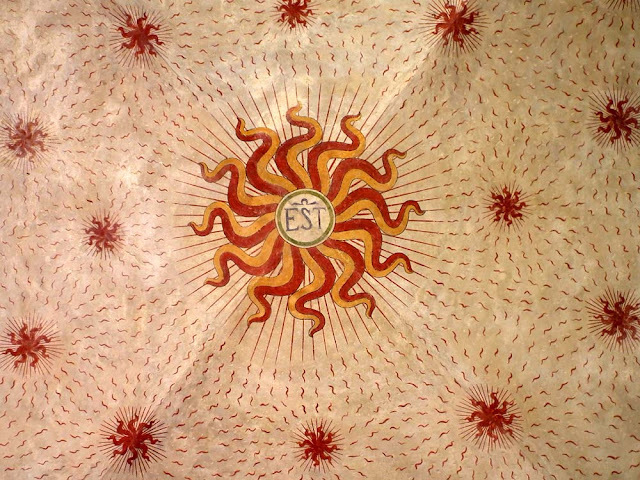 Their motto was Vipereos mores non violabo ('I will not violate the customs of the serpent'). The snake is blue on a silver background (azure on argent in heraldry speak). After the Visconti family died out the emblem was kept by the Sforza Dukes of Milan who succeeded them and it remains closely associated with the city (Alfa Romeo use it on their badge for example). The 'EST' is for Beatrice d'Este, wife of Ludovico Sforza, Duke of Milan. Nearby on the same colonnade ceiling in the Castello Sforzesco is the serpent eating a Saracen, representing Ludovico himself. 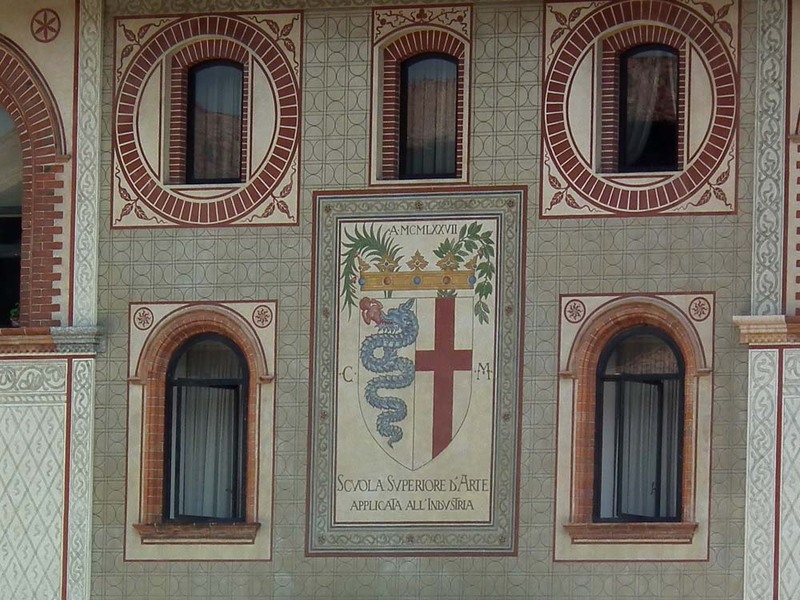 The classic Visconti arms, showing the serpent combined with a red cross (just like Alfa Romeo use). The date on this one is 1977, by the way. This version with the Imperial eagles must date from the end of the Sforza reign, when they ruled courtesy of the Habsburg Charles V.
Loire Valley Nature: A new entry has been added for Clouded Funnel mushroom Clitocybe nebularis. You probably don't want to try eating this mushroom, no matter what your old field guide says. A photo has been added to the entry for Ceps Boletaceae. The two mushrooms in the photo are the most prized edible species in the forest. A new entry has been added for Dead Moll's Fingers Xylaria longipes. This rare club fungus turns out to have all sorts of surprising uses.